This article is about the original 1971 television film. For the remake, see Brian's Song (2001 film). For the Family Guy episode, see Movin' Out (Brian's Song). Brian's Song is a 1971 ABC Movie of the Week that recounts the details of the life of Brian Piccolo (played by James Caan), a Wake Forest University football player stricken with terminal cancer after turning pro, told through his friendship with Chicago Bears running back teammate and Pro Football Hall of Famer Gale Sayers (Billy Dee Williams), who helps him through the difficult struggle. The production was such a success on ABC that it was later shown in theaters by Columbia Pictures with a major premiere in Chicago; however, it was soon withdrawn due to a lack of business. Critics have called the movie one of the finest telefilms ever made. A 2005 readers poll taken by Entertainment Weekly ranked 'Brian's Song' seventh in its list of the top "guy-cry" films ever made. The movie is based on Sayers' account of his friendship with Piccolo and coping with Piccolo's illness in Sayers' autobiography, I Am Third. The film was written by veteran screenwriter William Blinn, whose script, one Dallas television critic called, "highly restrained, steering clear of any overt sentimentality [yet conveying] the genuine affection the two men felt so deeply for each other." Although based on a true story, the film did include some fictional scenes. 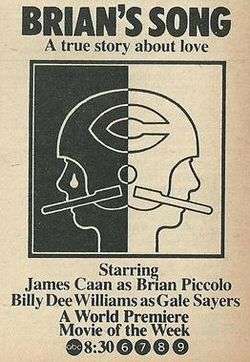 One example was when George Halas (played by Jack Warden) told Gale Sayers that he wanted to bench Brian Piccolo when he suspected that there may be a problem affecting his performance. He later learned of Brian's cancer. In reality, Jim Dooley was the head coach at that time, as Halas had retired from the position following the 1967 season. The movie begins as Chicago Bears running back Gale Sayers (Williams) arrives to team practice as an errant punt is sent to Sayers. Running back Brian Piccolo (Caan) goes to retrieve the ball, and Sayers flips it to him. Before Sayers meets with coach George Halas (Jack Warden) in his office, Piccolo tells him – as a prank – that Halas has a hearing problem, and Sayers acts strangely at the meeting. Sayers pranks him back by placing mashed potatoes on his seat while Piccolo is singing his alma mater's fight song. During practice, Piccolo struggles while Sayers shines. Sayers and Piccolo are placed as roommates, a rarity during the racial strife at the time. Sayers quickly becomes a standout player, but he injures his knee in a game against the San Francisco 49ers. To aid in Sayers' recovery, Piccolo brings a weight machine to his house. In Sayers' place, Piccolo rushes for 160 yards in a 17–16 win over the Los Angeles Rams, and is given the game ball. Piccolo challenges Sayers to a race across the park, where Sayers stumbles but wins. Piccolo is given the starting fullback position, and both he and Sayers excel. But Piccolo starts to lose weight and his performance declines, so he is sent to a hospital for a diagnosis. Soon after, Halas tells Sayers that Piccolo has cancer. In an emotional speech to his teammates, Sayers states that they will give Piccolo the game ball. After a game against the St. Louis Cardinals, Sayers visits Piccolo's wife, who reveals that Piccolo has to have another surgery for his tumor. After he is awarded the "George S. Halas Most Courageous Player Award", Sayers dedicates his speech to Piccolo. Sayers told the crowd that they had selected the wrong person for the award and said, "I love Brian Piccolo, and I'd like all of you to love him, too. And tonight, when you hit your knees, please ask God to love him." In a call, Sayers mentions that he gave Piccolo a pint of blood while he was in critical condition. Piccolo dies with his wife by his side. The movie ends with a flashback of Piccolo and Sayers running through the park, while the narrator says that Piccolo died at age 26, and is remembered as he lived, rather than how he died. The musical theme to Brian's Song, "The Hands of Time", was a popular tune during the early 1970s and has become a standard. The music for the film was by Michel Legrand, with lyrics to the song by Marilyn and Alan Bergman. LeGrand's instrumental version of the theme song charted for eight weeks in 1972, peaking at #56. Nashville pianist Floyd Cramer performed a popular version of "The Hands of Time". The film won an Emmy Award for Best Dramatic Program (1971–72). William Blinn won an Emmy for his teleplay, and Jack Warden won for his performance as Coach Halas. Caan and Williams were both nominated for best leading actor. Thirty years after its original airing, a remake was aired in 2001 on ABC's The Wonderful World of Disney starring Mekhi Phifer in Billy Dee Williams' original role as Sayers and Sean Maher as Piccolo, the character originally played by James Caan. 1 2 3 4 5 Marill, Alvin H. (1987). Movies Made For Television: The Telefeature and the Mini-series, 1964–1986. New York: Baseline/New York Zoetrope. pp. 53–4. ISBN 0-918432-85-5. ↑ Thomas, Bob (then-parent and future corporate sibling of the movie's production company, Screen Gems). "TV 'Brian's Song' on movie screens", The Dallas Morning News, April 29, 1972, page 2. 1 2 Harry Bowman. "Broadcast Beat [TV column]: 'Brian's Song' superior film", The Dallas Morning News, November 27, 1971, page 7A. ↑ Bud Talley (2 December 2001). "Brian's Song (TV Movie 2001)". IMDb. Retrieved 24 September 2015.